Connect supported receipt printers, cash drawers and bar code scanners to the Square app on the iPad. If you have any connectivity issues after following the steps below, learn how to troubleshoot your hardware. To get started, make sure your printer has an Ethernet interface. Use Printer Stations to save your settings to your device and easily swap between connected printers. Connect one end of the Ethernet cable into the rear panel of the printer, and plug the other end of the cable into the wireless router’s Ethernet port. Toggle on Receipts, Order Tickets and/or Order Ticket Stubs. To connect multiple iPads to the same Ethernet printer, follow these steps with each iPad. You can also print copies of the same receipt to multiple printers from one iPad. Tap Settings > Hardware > Printers. 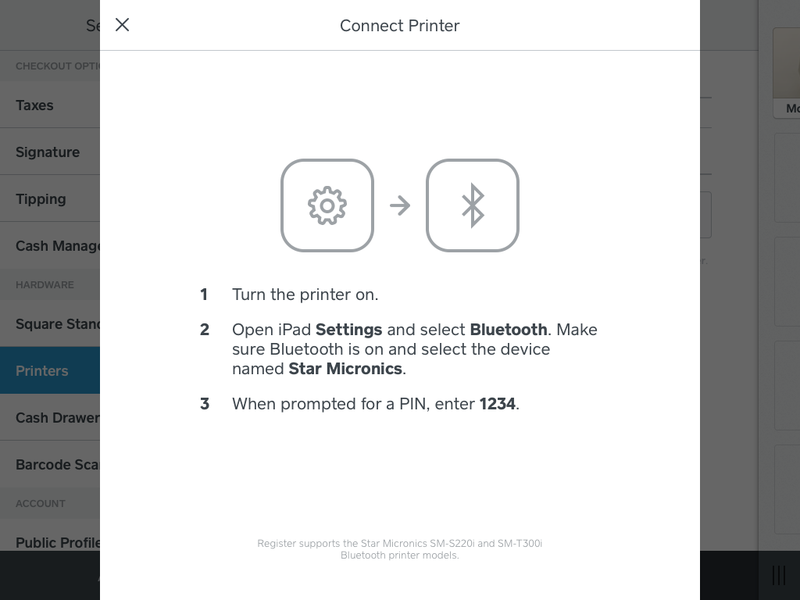 Tap “Connect a Bluetooth Printer” and follow the steps in the new window. From the Square app you’ll see confirmation the printer is connected. Once your receipt printer is connected, learn more about printing customer receipts and order tickets for your kitchen. Note: Bluetooth printers are only compatible with iPads running the latest version of Apple iOS. The Square app officially supports APG, Star Micronics and Heckler printer-driven cash drawers though other brands may work. Note: Certain USB cash drawers are supported by the Square app but require a Square Stand to open automatically. Scan the bar code below to put your Bluetooth Socket Mobile 7Ci into iOS pairing mode. Hold the Trigger button (large button) and the Power button (small button) down together until you hear 3 beeps.